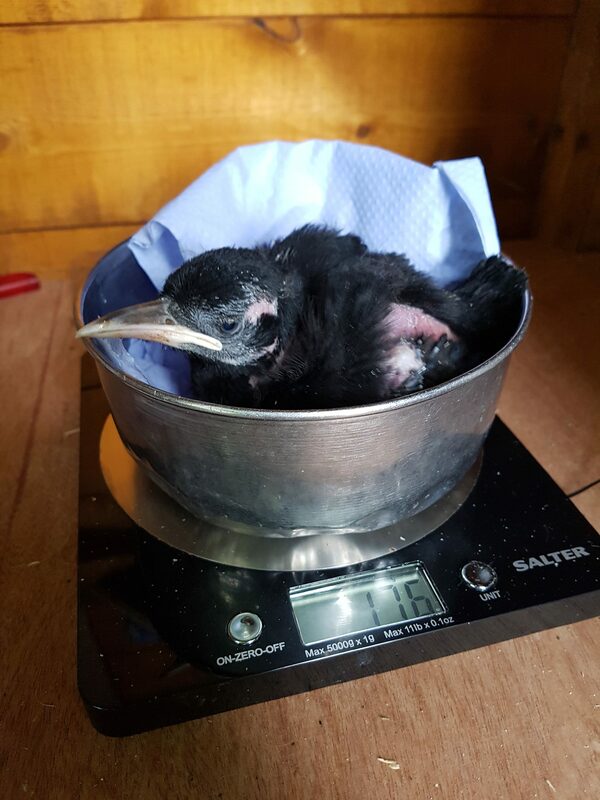 The 2018 breeding season has now officially ended, as all the chough chicks have left their respective nests. As the eggs were laid at different dates, it would seem obvious that the chicks would fledge at different dates. There are other factors, such as parental care, numbers of siblings, and (in the wild), availability of food. 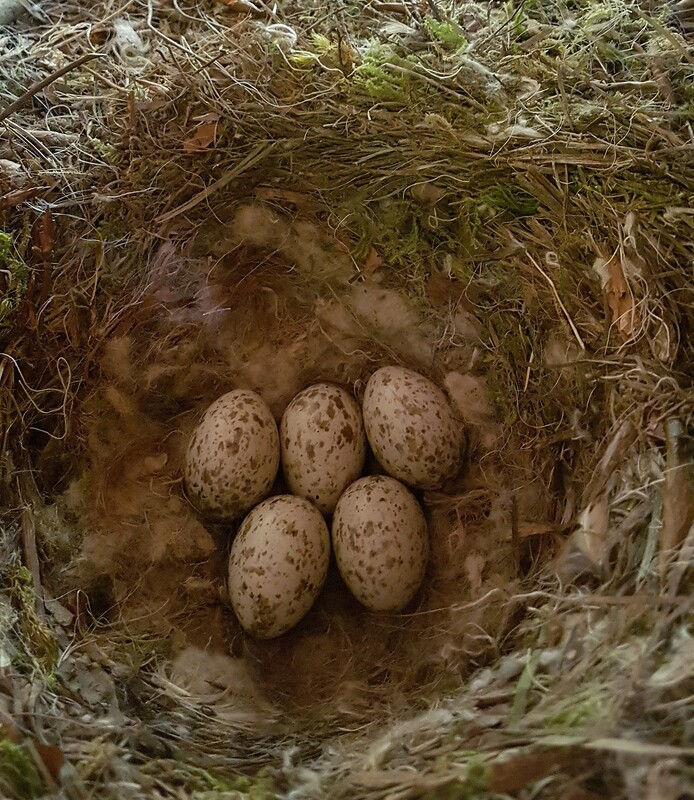 We know from previous records and observations, that the parents in nest number one are very capable – and have in fact “fostered” chicks when their own eggs have failed. The chicks from nest number one were indeed the first out. The first chick accidentally bumped out by an adult on June 18th. The other two siblings followed on June 21st and 23rd respectively. The singleton in nest number four was out next on June 24th. In theory, this bird should have been the first to fledge, as it was getting all the attention from both parents. However, we had noticed that the female in nest four tended to overbrood, or sit on the chick – which meant the male could not feed the youngster. Finally, the chicks in nest number two emerged on 26th, 27th, and 28th of June, and July 1st. Sadly, one of the chicks was found dead in the aviary on 28th of June. However, the other three siblings are now practising short flights, and teaching themselves how to hunt for prey. So our total “choughage” for 2018 is seven new birds, which is more we expected given the terrible weather at the start of the season, and the fact that there has been a mealworm shortage for the last six weeks. All the chicks follow their parents, still begging for food. However, they are not getting too much attention from them. They do go back to the nest boxes from time to time for short naps, and also to roost. (The chicks, not the adults). I did watch a chick in nest number two play with a feather in the nest. It poked and prodded it, then proceeded to start adjusting some of the twigs. A hopeful sign for the future..? This entry was posted in Breeding, Cornwall, News, Paradise Park, Ray's Ramblings on 5th July 2018 by RayHales. “Don’t count your chickens before they are hatched”, the old saying goes. And so it was with our thirteen fertile chough eggs. Most of our eggs did hatch – sadly, some did not survive. 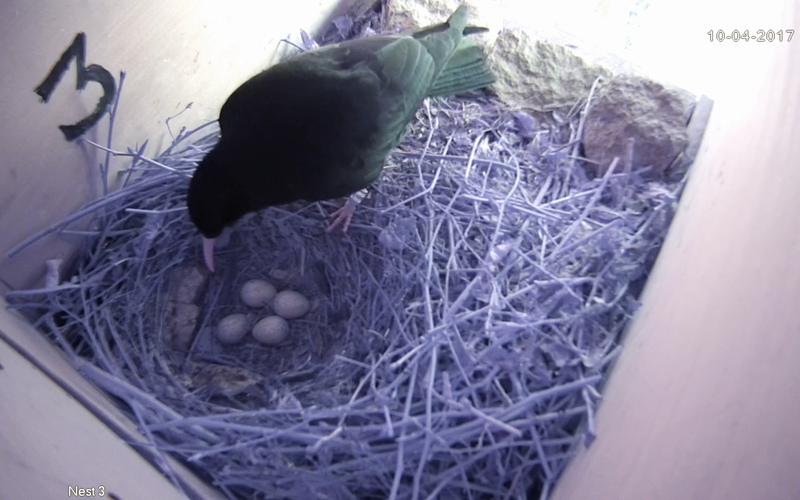 For reasons known only to the choughs themselves, the eggs in nests three and five were taken out by the parent birds. We checked the CCTV. Nothing unusual. No disturbance. Very odd. (Nest five had an evening feed as normal, and the female simply never got back on the eggs). However, we now have eight chough chicks, in various family groups at various stages of growth. Nest number one has three chicks, hatched on May 10th and 12th. All are growing well, and rapidly destroying the nest as they do so. One chick was noticed to be breathing heavily and “crackling” – a clear indication of gapeworm infection. As a precaution we pulled all three chicks from the nest and dosed them with specific amounts of Ivomectin. All are now back to full vigour. Nest number one chick growing fast. (Get a bigger dish) Pic R Hales. Nest number four has a single chick hatched on May 14th. Sadly the other two eggs in this nest did hatch, but the chicks died as they emerged. 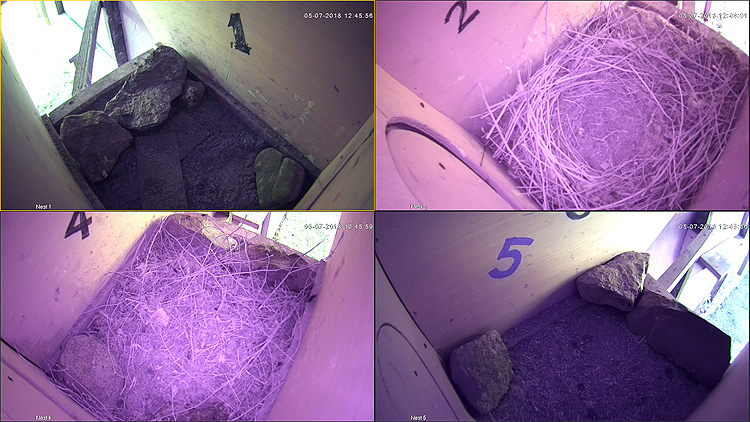 Nest number two has become our favourite – producing four chicks at the first attempt. 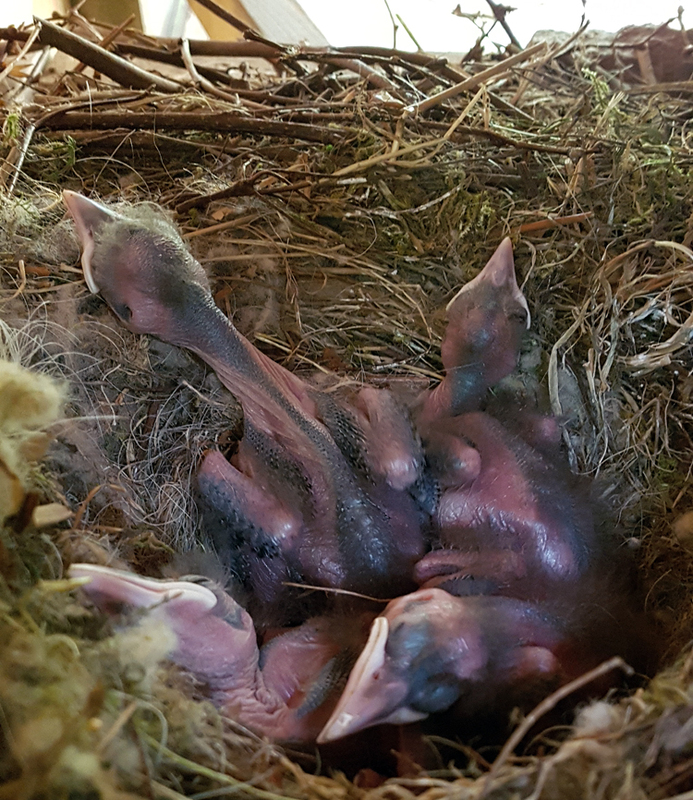 Three hatched on May 17th, and the last kept us guessing until May 19th. Our main concern was for this final chick, who was obviously going to be the last to get to any feeds. 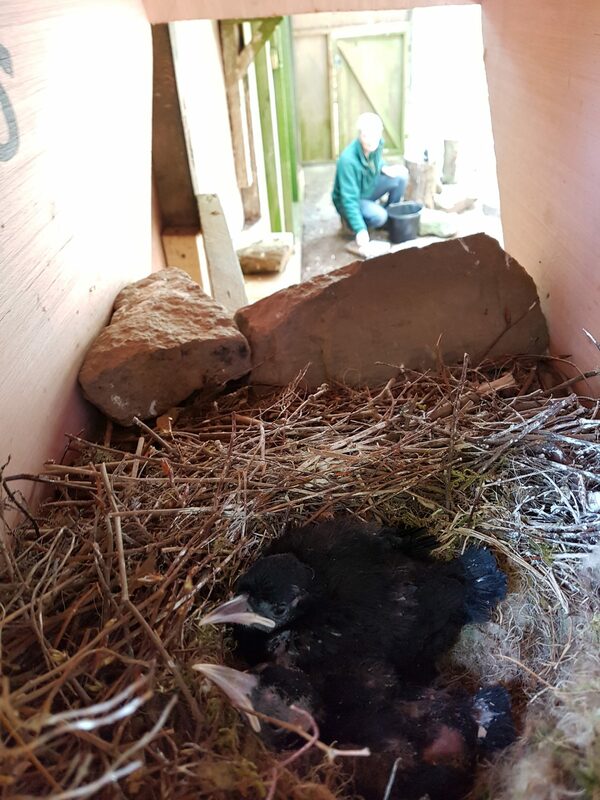 Four lovely chough chicks in nest two. Each day, we would take the chicks out to monitor growth, and each day we would favour chick number four with supplementary feeds. It has now caught up with it’s siblings. The parent birds on nest number two, are proving to be very capable. Both birds attend the youngsters, and both take turns feeding and taking out the faecal sacs. One delightful surprise, is that the female likes to have a wash and brush-up in the afternoons. We have noticed her coming in to the nest freshly washed on several occasions. This may not just be vanity, it may be that she is actually cooling the youngsters as they are all crammed in the nest together, they may possibly be getting to hot. This entry was posted in Breeding, Cornwall, News, Ray's Ramblings on 29th May 2018 by RayHales. “Don’t count your chickens before they are hatched”, the old saying goes. Today was our day to do just that. 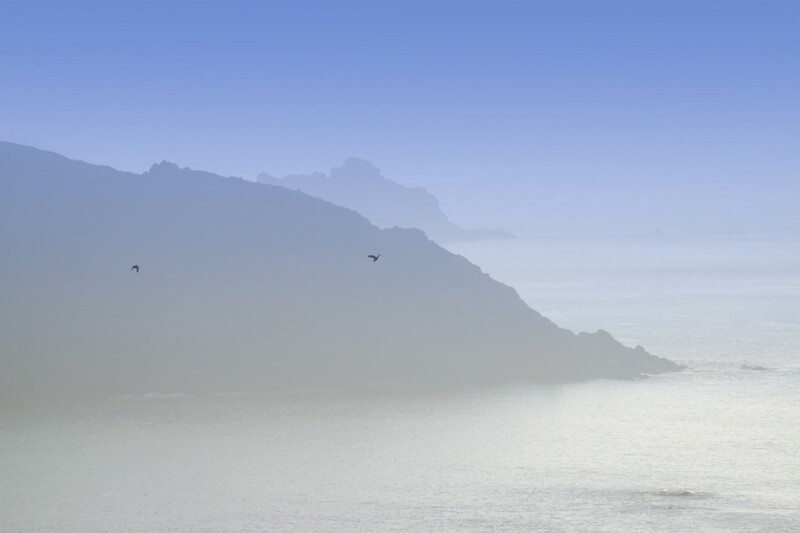 With choughs. The first of the five clutches is due to hatch at the weekend. The weather is now much better, and generally warming up, so it was time to see how many of our thirteen eggs are likely to hatch. All five females sitting tight on their clutches of eggs. This is a fairly simple procedure, using the light from a mobile phone to “candle” the eggs. Ali goes in to each aviary, to add food and generally rummage about in order to distract the adult choughs. I then open the inspection hatches, hand the eggs to keeper Becky Waite, and she checks to see if they are fertile. (I have passed this job over, due to my remarkable inability to notice fully formed chicks inside the eggs). The birds had been late getting into the aviaries. The weather has been horrible, both before and after the birds have been installed. Winter was nasty, and spring has been wet. As previously posted, two of our pairs are now quite old, and were infertile last year. We were not expecting great things. But great things occurred – all thirteen eggs are fertile. This includes two eggs from a female who is twenty years old! This entry was posted in Breeding, Cornwall, Paradise Park on 8th May 2018 by RayHales. The almost-continual rain has now stopped, and our birds are building in earnest. Birds building in all five boxes. We are now into the stage of supplying the nest aviaries with materials. We start with large twigs, then move on to smaller twigs and heather. In a few days time we will be adding moss and lichens – finally finishing with horse hair. This entry was posted in Breeding, Cornwall, News, Paradise Park on 4th April 2018 by RayHales. 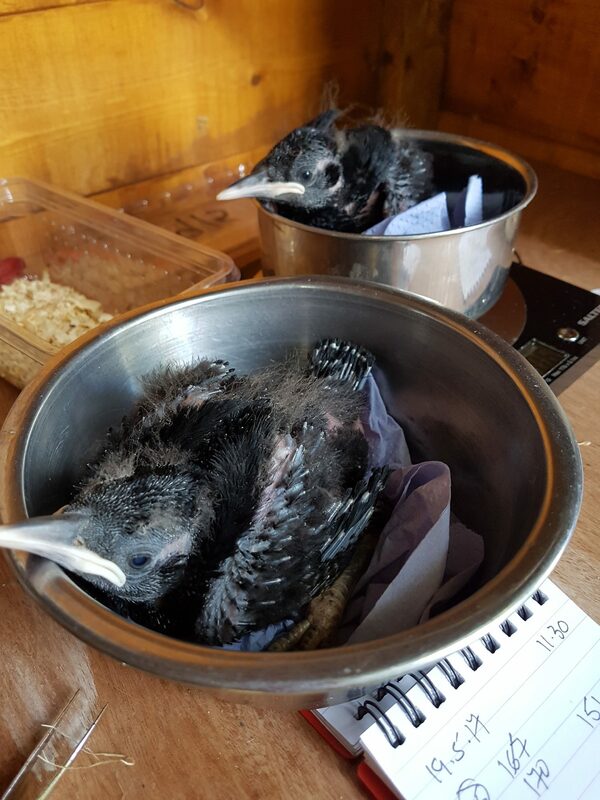 The chough nest box webcams are now live – click here. After a long winter of rain, rain, more rain, and then snow, our breeding aviaries are ready for birds. 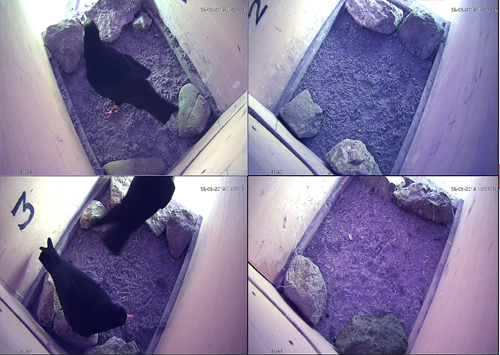 The choughs were put in this morning, and are already checking the boxes. Later today we will put twigs in the aviaries, and the nest-building will start in earnest. The recent cold, wet weather has pushed back the start of the breeding season, but looking at the birds’ behaviour, they are ready to go! This entry was posted in Breeding, Cornwall, News on 28th March 2018 by RayHales. The chough breeding season is going well here at Paradise Park. So far we have only lost one chick this year. The second chick in nest three died just after hatching – giving an indication of what a traumatic experience breaking out of an egg can be. We now have three nests with two siblings and one with a solo chick. This gives the parent birds every chance to rear the youngsters, while we closely monitor weight gains and general health. If a chick falls behind, we can give it a boost with supplementary feeding and medication where necessary. However, the youngsters have kept us on our toes. The larger chick in nest five suddenly started “stargazing” – it’s head folded almost flat over its back. Very worrying. We gave it a course of antibiotics, along with gapeworm treatment and vitamin supplements. The head stayed in the same postion for two days, with the parent birds somehow managing to feed it. Then overnight, the head returned to normal position, much to our amazement. We had a further scare when the younger chick in nest two had one eye closed, and did not open it even when being handled or fed. Once again, a course of antibiotics soon had it back to normal. Most the chicks are now above 200 grams in weight, and it is at this point that we stop taking regular weights. One practical reason for this is that the chicks are beginning to get highly mobile, and when put back in the nest start climbing around. Another reason is that their feet are now fully developed, and have unbelievably clinging claws. Sometimes trying to get the birds out of the nest can mean pulling some of the nest material out along with the chick, resulting in potential damage to the nest or chick. 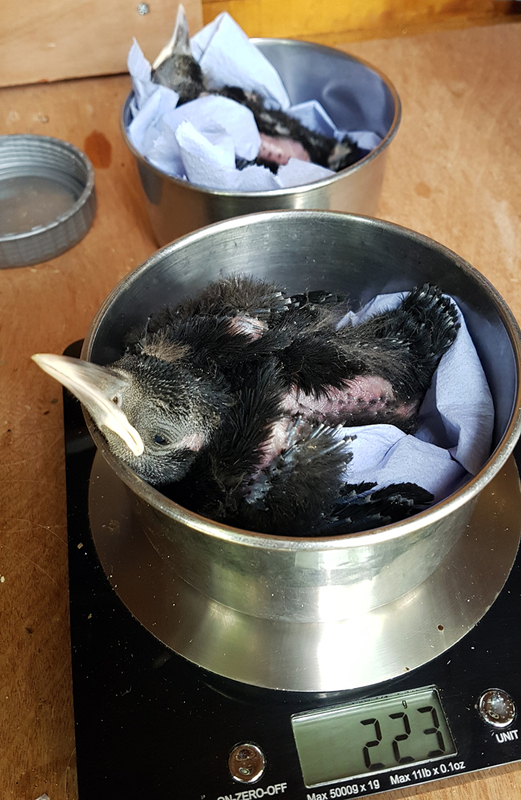 We have noticed that the nests this year seem to be less robust than normal – possibly as a result of the birds being put into the aviaries at a late date (due to bird flu movement restrictions). This is the first year we have seen the chicks sitting on the floor of the nestboxes, on the wood of the box itself. This could lead to the chicks having splayed or deformed feet. The solution – the Trump Toupee! Once the birds were large enough, we slipped a coir mat underneath, giving them something to grip on to. (We did not do this when they were too small, as there was a risk of the parents pulling the whole thing out – along with the chicks. This entry was posted in Breeding, Cornwall, News, Paradise Park on 24th May 2017 by RayHales. 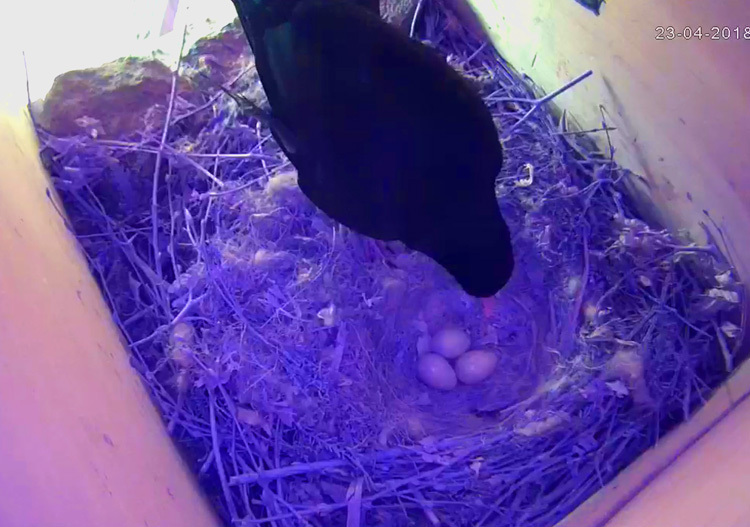 So far our choughs have laid sixteen eggs this year – and there may be more to come from nest four. Given the ages of some of our breeding birds, we have taken the step of checking all eggs laid to see how many potential chicks to expect. We quickly took the eggs in turn from each nest and tested them by “candling”. (These days we don’t hold the eggs up to a candle, but use the LED light from a smartphone). The results were slightly disappointing – with only the eggs in nests two and three being fertile. However, as all the pairs have taken such great time and energy to produce nests, we decided to share the fertile eggs into the infertile nests. We would then put the infertile eggs back in to replace the fertile ones taken. This meant that each successful nest would only have to rear two chicks, spreading the load on the parents. Five nests, sixteen eggs – possibly with more to come. Each of the laying pairs now has two fertile eggs to deal with. Two chicks have hatched in nest three, but sadly the younger chick died almost immediately after hatching. Nest five also has a chick, with another expected to hatch soon. Both sets of parents are doing very well, taking turns to feed the tiny chicks. Hopefully, in the next few days all the remaining fertile eggs will hatch. The infertile eggs will be left in the nests for a few days, as they act as good heat stores when the females are off the nests. This entry was posted in Breeding, News, Paradise Park on 28th April 2017 by RayHales. The fine weather has brought a flurry of egg-laying activity. On Saturday we eggs were laid in nests one, two, and three. (It is likely that the third egg in nest 3 was laid overnight on Friday). On Sunday, another egg arrived in nest 3, this was first noticed at lunchtime. Monday brought three more eggs, with additions in nests one and three. Later in the afternoon we had the arrival of the first egg in nest five. This may be a record, as the female in the nest will be nineteen years old this year – making her the oldest known breeding chough. It gets more difficult to give exact timings, as the females are now sitting on the eggs for longer periods, as incubation begins in earnest. This entry was posted in Breeding, Cornwall, News, Paradise Park on 10th April 2017 by RayHales. Just a few days later than last year, we have our first chough egg. It was laid by the female in nest 3 – she was also the first of our birds to lay last year. She went on to lay four eggs in total. Two of the chicks which hatched were later taken away to be hand-reared. This female is a seven year-old, and has laid several clutches in the past. Her male partner is a very good parent – taking good care of the chicks when hatched. This entry was posted in Breeding, Cornwall, News, Paradise Park on 4th April 2017 by RayHales.